The recent Lewis and Curry study of climate sensitivity estimated from the transient surface temperature record is being lauded as something of a game-changer – but how much of a game-changer is it really? The method at the heart of the new study is essentially identical to that used in the much discussed Otto et al. (2013) study. This method uses a simple equation of the energy balance of the climate and observations of global temperature change and estimated ocean heat uptake anomalies along with a time series of historical radiative forcing (code), in order to make inferences about the equilibrium climate sensitivity (ECS – the ultimate equilibrium warming resulting from doubling carbon dioxide concentrations) and its shorter-term counterpart the transient climate response (TCR – the warming at point of doubling after carbon dioxide concentrations are increased at 1% per year). [Ed. An overview of different methods to calculate sensitivity is available here. The L&C results are also discussed here]. Lewis and Curry use an updated radiative forcing estimate over that used in Otto et al along with slightly different assumptions over the periods used to define the observational anomalies. They use the latest IPCC numbers for radiative forcing and global temperature changes, but not the latest IPCC ocean heat content data. Their result is a 5 – 95% confidence interval on ECS of 1.1–4.1K and for TCR is 0.9-2.5K. These confidence intervals are very consistent with other constraints, from paleo or emergent observations and with the range of GCM estimates. For the TCR, arguably the more important measure of the climate response for policy makers as it is a better predictor of cumulative carbon budgets, the 5-95% confidence intervals are in fact almost identical to the AR5 likely range and similar to the CMIP5 general circulation model (GCM) estimated 5–95% range (shown below). 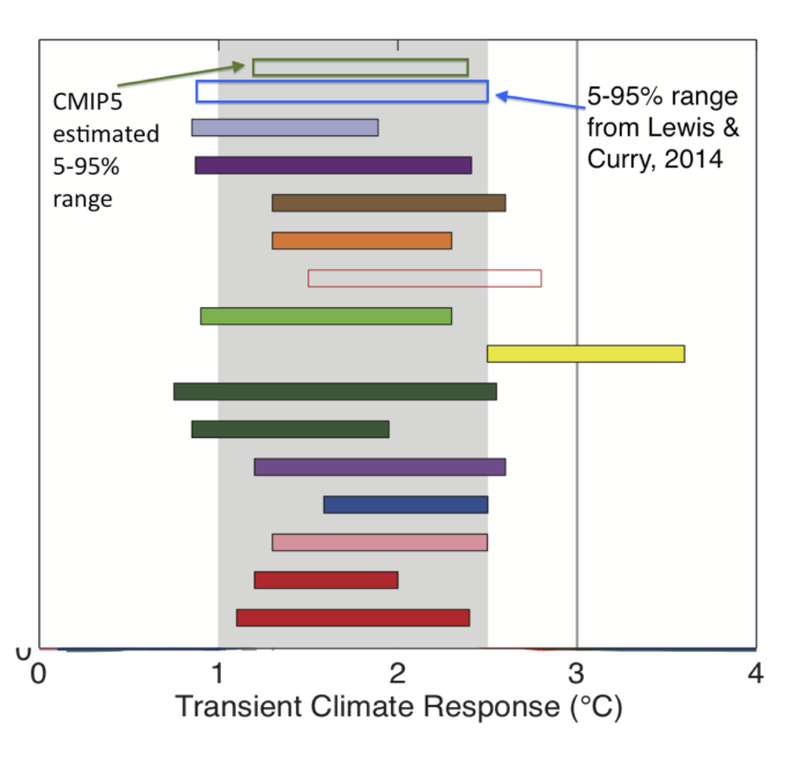 Figure 1: The 5-95% confidence ranges for transient climate response (TCR) taken from various studies as in Fig. TS.TFE6.2 of IPCC AR5 WG1. The green bordered bar at the top of figure is the estimated 5-95% range from the CMIP5 GCMs. blue bordered bar at the top of the figure is the 5-95% range from the Lewis and Curry (2014) study. The grey shading represents the AR5 consensus likely range for TCR. There is a difference between the Lewis and Curry 17-83% confidence intervals and the IPCC likely ranges for TCR and ECS. However, for all quantities that are not directly observable, the IPCC typically interprets the 5-95% confidence intervals as likely ranges to account for the possibility that the model used to derive the confidence intervals could be missing something important (i.e. non-linearity that would not be captured by the simple models used in Otto et al and Lewis and Curry, which can particularly be a problem for ECS estimates using this method as the climate feedback parameter is assumed to be constant in time) [IPCC AR5 WG1 Ch10.8.2]. In this case, accounting for more complete surface temperature changes (Cowtan and Way, 2013), or the hemispheric imbalance associated with aerosol forcing (Shindell, 2014), or updates in the OHC changes, may all shift the Lewis and Curry distribution. [Ed. This expert judgement related to structural uncertainty was also applied to the attribution statements discussed here before]. The median estimate of the TCR from Lewis and Curry (1.3K) is towards the lower end of the IPCC likely range and lower than the CMIP5 median value of around 1.8K. A simple way to understand the importance of the exact TCR value for mitigation policy is via its impact on the cumulative carbon budget to avoid crossing a 2K threshold of global surface temperature warming. Using the Allen and Stocker relationship between TCR and TCRE (the transient climate response to cumulative emissions) we can scale the remaining carbon budget to reflect different values for the TCR. Taking the IPCC CO2-only carbon budget of 1000 GtC (based on the CMIP5 median TCR of 1.8K) to have a better than 2 in 3 chance of restricting CO2-induced warming to beneath 2K, means that emissions would have to fall on average at 2.4%/year from today onwards. If instead, we take the Lewis and Curry median estimate (1.3K), emissions would have to fall at 1.2%/year. If TCR is at the 5th percentile or 95th percentiles of the Lewis and Curry range, then emissions would need to fall at 0.6%/year and 7.1%/year respectively. Non-CO2 emissions also contribute to peak warming. The RCP scenarios have a non-CO2 contribution to the 2K peak warming threshold of around 0.5K [IPCC AR5 WG1 – Summary for Policymakers]. Therefore, to limit total warming to 2K, the CO2-induced contribution to peak warming is restricted to around 1.5K. This restricts the remaining carbon budget further, meaning that emissions would have to fall at 4.5%/year assuming a TCR of 1.8K or 1.9%/year taking TCR to be equal to the Lewis & Curry median estimate of 1.3K (assuming no mitigation of non-CO2 emissions). “They use the latest IPCC numbers for radiative forcing and global temperature changes, but not the latest IPCC ocean heat content data”. The statement that Lewis and Curry (2014) does not use the latest IPCC ocean heat content data is simply untrue. Section 3.2 of the paper explicitly states that it uses the climate system energy accumulation observational best estimates and uncertainty ranges shown in Box 3.1, Figure 1 of AR5, which extend to 2011, the final year of all the analyses carried out in the paper. The change in ocean heat content accounts for the bulk of the accumulation. Gregory Johnson is acknowledged in the paper for supplying the underlying data. Your Figure 1 does not reveal that the Otto et al (dark green) and Lewis and Curry TCR distributions are much more heavily skewed than those from the other studies, as they (particularly Lewis and Curry) take greater account of forcing uncertainty. Whilst their 5-95% ranges may look similar to those of other studies, the bulk of their probability is concentrated towards the lower end of the 5-95% range. I would also question the 5-95% range of 1.2 – 2.4 °C TCR range shown for CMIP5 models, presumably taken from Table 9.5 of AR5. I have sourced TCR values for 33 of the 38 CMIP5 models used for the RCP8.5 runs. 9% (3 models) have TCRs of 2.5 °C or above; several others have TCRs of 2.3 or 2.4 °C. The first “Lewis and Curry” link points back to this article, not the original paper as I would have expected. Nic Lewis, I have one question for you. How could you seriously muck up an analysis that even a non-climate scientist like myself can do properly? Why didn’t you use an OHC content that is closer to 0.8 W/m^2 ? If you use OHC-Data from IPCC why you got 0.51W/m^2(or 82.3 ZJoule) Heat-uptake for 1995-2011 in best estimate, when at the same time the Heat-Uptake for 1995-2011 from IPCC-Data give a Value arround 130 ZJoule (or arround 0.80W/m^2). You self linked it here: http://niclewis.wordpress.com/the-implications-for-climate-sensitivity-of-ar5-forcing-and-heat-uptake-estimates/ its easy to see by plotting the heat.txt. To be honest, do you trust you own Model which is saying from 1995-2011 was the Heat-Uptake arround 8.23*10^22 Joule, when at same time we recorded only in 0-700m this value and you argue, thats best estimate? Lower bound i would say..
My reading of your paper (section 3.2) was that you are using an update on the base period system heat uptake used in Otto et al and AR5? If this is not the case, then I will happily be corrected on this point. As to the source of the estimated 5-95% range for TCR from the CMIP5 models (1.2-2.4K), it is taken directly from the range stated on page 84 (TFE.6) in the AR5 technical summary. In the figure I am comparing like-for-like 5-95% TCR ranges, as that is what is relevant when comparing to the AR5 likely range. The bars are added to reflect the style of the original figure in AR5. I explicitly discuss the median estimates of your work and how they are on the lower end of the estimated ranges (which are indicative of the skew in the likelihood density along the confidence interval). Indeed, the point is explicitly made that if the TCR is 1.3K, as opposed to 1.8K, whilst both require significant mitigation relative to today’s emissions trends if a 2K goal is to be achieved, it might make the difference between an achievable average rate of mitigation and an unachievable one. Are you talking about 0.8W/m2 OHC flux over the whole Earth surface or just ocean surface? Lewis & Curry’s 0.51W/m2 is for whole Earth surface. Using C&W instead of HadCrut4, delta-temperature in the main result goes from 0.71C to 0.78C, and the TCR “best” estimate goes up proportionally i.e. 1.33C -> 1.45C. C&W is definitely a more defensible choice, as bias coverage in HadCrut4 prevents an “apples-to-apples” comparison. This is especially true since, as James Annan points out, Lewis and Curry have failed to “mask off” the corresponding model SAT. If possible, I’d be very grateful if someone could adapt Figure S1 panels C & D of Rogelj et al. 2014 by adding a “case k” to the original cases a-j, where case k would represent the Lewis and Curry. In addition, an adaptation of Table S3 from the same Rogelj et al. 2014, modified to include rows for this “case k,” would be helpful. Ocean heat uptake for 1995-2011 is indeed correct based on Box 3.1 in AR5 (@Christian: You’ve got to scale the heat uptake to the entire Earth’s surface, not only the ocean surface, which brings your 0.8W/m2 down to 0.5W/m2 … as Paul S has kindly pointed out already). However, the 1859-1882 heat uptake estimate is based on a multitude of assumptions, all of which are essentially independent of AR5. Arguably, the estimated difference in system heat uptake between base and final period (0.36W/m2 as of Table 3) is hence also not a “true” AR5 estimate. There are several reasons why this might pose a problem, but given that non-linearity is a much more severe issue in the first place, it isn’t really something which bothers me. Trumpeting such results as if they present something particularly meaningful certainly is (particularly when considered in the light of more recent work, which would alter the conclusions of the paper substantially). Regarding the much more relevant forcing assumptions, I am pleased to see that you, Nic, eventually used the AR5 aerosol ERF (rather than your adjusted number) for the central estimate. One issue which we (i.e. Tom Curtis and I) couldn’t resolve over at ATTP was that the AR5 forcing given in Annex II points towards 1.93W/m2 forcing increase (between the 1859-1882 and 1995-2011 periods), compared to 1.98W/m2 shown in Table 3 in the paper. Doesn’t sound like much, but given that the combination of more recent HadSST and Cowtan&Way temperature data brings the TCR estimate up to 1.5K already (let alone problems related to hemispheric forcing differences), it might well be of relevance. Perhaps you can briefly clarify what might be the cause for this rather small discrepancy. Thanks! I’m not sure I fully understand what you are saying about ocean heat uptake (OHU) data. As I said, for the final periods Lewis & Curry (2014) uses the latest IPCC AR5 data, as used for Box 3.1, Figure 1. The paper states this at the start of section 3.2. The data used in Otto et al (2013) is an earlier, slightly different, version of the Box 3.1, Figure 1 data. For the base period, Otto et al (2013) followed what I did in a 2012 blog-published energy budget study based on the AR5 second order draft (SOD) forcing data (http://wattsupwiththat.com/2012/12/19/why-doesnt-the-ar5-sods-climate-sensitivity-range-reflect-its-new-aerosol-estimates/). I adopted the OHU estimate given in Gregory et al (2002) for the 1861–1900 period of 0.16 W/m², but deducted only 50% of it to compensate for the Levitus et al. (2012) regression trend that I used for the final period implying a somewhat lower 2002-2011 OHU than is given in the SOD. I also trebled the Gregory et al (2002) uncertainty estimate. Otto et al did exactly the same, although it did use the AR5 OHU data. The Lewis & Curry base period OHU estimates were instead derived from Gregory et al (2013); the resulting 1861-1900 estimate agrees to that from Gregory et al (2002), as stated in section 3.2. The information given in Gregory et al (2013) permitted separate estimates to be made for OHU in the three base periods used. Only 60% of the estimated OHU values were used, on account of the model used by Gregory et al having (like most AOGCMs) fairly high climate sensitivity. ” As to the source of the estimated 5-95% range for TCR from the CMIP5 models (1.2-2.4K), it is taken directly from the range stated on page 84 (TFE.6) in the AR5 technical summary. ” Yes; we are not disagreeing on the source. As TFE6 Figure 2 says, that range comes from Table 9.5. ” The bars are added to reflect the style of the original figure in AR5.” Understood, but the TCR figure in AR5 also gave probability density functions for studies and a histogram for CMIP5 models, which much more clearly revealed the difference between the oppositely skewed Otto et al and CMIP5 probability distributions. Anyone have a pointer to something like those comparisons, but showing each as a probability distribution curve rather than a rectangular bar? This post is more or less a thinking-out-loud exercise, but I thought I would inflict it on you, since there are not enough blog posts about climate change. It’s a comparison of point estimates of expected global mean surface temperature change, as given by the IPCC AR5, and ones I computed using Transient Climate Sensitivities (TCS)…. My comment: I suspect the problem you face isn’t whether the green house effect exists or not, or whether humanity issues more or less CO2. The problem, I believe, is the disagreement over parameters such as TCR and ECS, and what portion of the temperature increase from 1973 to 1998 can be attributed to Anthropogenic emissions…..by insisting the issue is only a debate over global warming you got stuck in first gear. And maybe this is the reason the problem gets a low priority in people’s minds. You are using a very simple and easily defeated idea. CO2 Law dome, last 1000 years. We are in the mid-Pliocene at 400-ppm CO2 waiting for natural systems to catch up so it’ll be at least 2C warmer and sea-level 25m/82ft higher when that happens, how fast is the only question as long as greenhouse & waste-heat emissions continue unabated. To frame reality in terms of the gain in CO2, that was 1-ppm/180-years at the highest rate-of-change at the end of the Wisconsin ice-age, we’re at 3-ppm/year, 540-times faster than recent geologic history. Using the worst-case scenario seem valid the way Greenland & Antarctica’s ice-sheets are going, nothing less is gambling. Are you willing to say where you got the mistaken information you relied on? Many people repeat opinions without citing sources. As John Mashey points out, facts citing good information will help you reach conclusions. We’ve all been fooled by opinions posing as facts, they come from all sides of the issue. Pushing hard for cites is one way to test sources. re #18 CO2 Law dome, last 1000 years. Your link doesn’t address the point made. CO2 forcing in the mid 20th century relative to ~1800 was ~0.6 w/m2 – or about one third of the forcing in 2014. This is interesting timing, as today Durak & others have come out with a paper claiming the warming in the southern oceans has likely been underestimated. So perhaps, after the paper can be digested and the results confirmed (or not) it would make sense to insert a new number for the OHC update rate. John Finn says:	“… CO2 forcing” (ignoring all else). It would be rather a distraction to invite people to retype everything yet another time again, eh? You can look this stuff up. He could give you pointers to sources, as can anyone who’s read the science. Trust those who do at least enough to read for yourself about the material and think. And, of course, there are feedbacks. But John Finn has been here a long time and knows all this. It’s a study of the studies. This paper won’t give you “a new number”– that’s not what they’re doing there at all. The USA has achieved some notable emissions reductions through shale gas, but those are inherently limited by the relative carbon intensities of gas and coal. So, to be short, given full political commitment to emissions reduction, globally, I reckon we could do about 2% per annum, if lucky. A few more years of inaction and that 2% per annum reduction rate isn’t going to keep us inside a carbon budget, even for 1 TCR of 1.3K, let alone 1.8K, or worse. We need a binding, ambitious deal at Paris. Nothing written above changes that in the slightest. This is consistent with other estimates and inconsistent with various spin in media outlets, or a global warming “pause”. Note that the study has large error estimates, which is what you’d expect given it relies on little direct measurement and infers from other data (such as sea level). Durak et al. clearly imply climate sensitivity estimates using this data would be adjusted higher. Not sure what Llovel et al. imply, given their estimates are consistent with others. Their 0-2000 m estimate is quite large. I’ll let our experts here comment on that. “Scientists at NASA’s Jet Propulsion Laboratory in Pasadena, California, analyzed satellite and direct ocean temperature data from 2005 to 2013 and found the ocean abyss below 1.24 miles (1,995 meters) has not warmed measurably. Study coauthor Josh Willis of JPL said these findings do not throw suspicion on climate change itself. They should perform a more comprehensive research then. I don’t really trust the validity of Lewis and Curry climate estimation. Pretty much on the mark re projected temps with 2.8C for doubled CO2. I like to show this to skeptics who say models can’t predict anything correctly and where was the prediction that the oceans would be a factor (they think climate scientists are just making stuff up post hoc. Some caution re Llovel et al. Their energy imbalance estimate of +0.64 W/m2 is ocean only, which could very easily be misinterpreted the way it’s written in their abstact. For the entire planet (which would be the Earth’s or planetary energy imbalance) their actual value is +0.45 W/m2! Would also be consistent with their estimates of the change in sea level height. Given that ocean heat uptake between 2004 and 2013 was indeed a bit smaller than before (at least in some OHC dataset), it’s perhaps not too surprising that their number is lower than previous estimates that had years before 2004 included. It’s also worth noting that the slight deep ocean cooling found in Llovel et al. is an inverse estimate only, derived by comparing trends of upper level OHC and sea level height measurements (from satellite altimetry, GRACE and in situ observations) and then closing the full ocean heat content budget. The comparably low imbalance number doesn’t contradict the potentially higher ocean heat uptake before 2004 as of Durack et al. After all, everything seems to add up very neatly. Yes, but was another error, what cause are wrong heat-uptake Value (time period length). To get sure about, i used estimates of Levitus (2012), estimate from this, how much Forcing is equal to 1*10^22 Joule or 10 ZJoule and then can also reproduce LC14-Value. I am soory about getting wrong about heat-uptake, but the most of errors are the simple ones, you never have thought to make a mistake about. IPCC and the other climate models do not consider nonlinear feedbacks, as you pointed out. The reason for this is that it is impossible to model or predict the occurrence or rate of feedbacks such as albedo flips, methane releases, accelerated destruction of carbon sinks, etc. The wish to avoid mathematical embarrassment at some point in the future tells us that scientists have been so intimidated that they are reluctant to even discuss scenarios that are inherently unpredictable with respect to numerical precision. This flaw is not acceptable, in my opinion, and should drive an attempt to work with modern probability and chaos theory professionals. We look forward to the publication of your groundbreaking paper, Mike. You really don’t understand the culture and practice of Science, you know. There are radical leftists who deny the overwhelming scientific evidence that anthropogenic global warming is both very real and very dangerous. And they are just as wrong as the right-wingers, conservatives, centrists and liberals and others of various political persuasions who deny the science. Do you suppose that branding yourself “liberal” will make your claims more persuasive? Do you suppose that ad hominem attacks will make YOUR claims more persuasive? It’s well known that most “deniers” have a political agenda. I just wanted to make it clear that I don’t. As for the rest, I invite you read what I have to say before forming a judgment. Having read through your blog post, it would be incredibly charitable to tell you that there are very big gaps in your understanding of climatology, far too big for you to be tapping out arguments on the reality of AGW with any shread of credibility. Less charitably, I would be more inclined to ask why you don’t see yourself as a climate denier. Whatever your background, you still manage to conclude “I see no point, therefore, in diverting vast amounts of money and resource in a quixotic attempt to reverse global warming by seriously undermining one of the most precious resources we have: fossil fuels.” But of course, deniers are in denial about being deniers, aren’t they. Climatology has no problem linking OHC to AGW. That is not to say that there are no issues with “trying to understand the nitty-gritty details,” but such issues “do not throw suspicion on climate change itself.” Yet, even though you took these quotes on board, you still manage to deny AGW. Victor, your post simply rehashes tired cherry picks. The date is cherry-picked, the data is cherry-picked (RSS is the only data set that yields this result), and the concept is flawed: the ‘hiatus’ is nothing unusual, given the nature of the observed data set. I should add that using RSS also has the effect of lengthening the necessary period for reliably detecting the anthropogenic signal because (like the other main satellite data analysis, UAH) it refers not to surface temperatures but to lower troposphere temperatures generally. Those temperatures are considerably more variable than surface temps–‘noisier’, if you will. So the signal takes longer to emerge from the higher noise levels in those data sets. You can see that the red plot ‘swings’ a lot further than the blue–and you can also see the cool ‘bias’ since 1998. As noted therein, if you look for global warming since 2000 you will (if sufficiently naive) reach quite a different conclusion. Your politics are irrelevant. What matters is that you are wrong. It is simply flat-assed wrong to cherrypick 1998–the biggest El Nino in memory–as a starting point. This one mistake invalidates everything you say in your post. Might I recommend a course in elementary statistics? Do you realize that the real scientists are not intimidated by words like “nonlinear”? If there were significant benefit from introducing additional feedbacks–be they linear or nonlinear–scientists would be all over it. How about leaving science to the scientists? Curry had an op-ed in teh WSJ yesterday touting her paper with Lewis. Looks to me like many posting here are in denial about the hiatus. As I understand it, most climate scientists agree on that score. The NASA scientists whose paper I quoted clearly accept the reality of the hiatus, referring to it as an ongoing “mystery.” As far as cherry picking is concerned my intention was not to present a comprehensive review of all the research, but simply to display graphs that most clearly illustrated the problems I see. If certain details were thereby exaggerated, I apologize. But you can’t simply dismiss a graph as cherry picked simply because it doesn’t suit you, I’m sorry. My point was not that the hiatus began in any particular year, nor that it followed any particular trajectory. My point was that, at a certain point roughly within the last 18 years or so, the correlation between warming and CO2 emission seems to have broken down. If you prefer 15 years to 18 years fine — it doesn’t really matter. I also pointed out the lack of correlation prior to 1975. Sure, we see a situation where both warming and CO2 emissions have clearly risen over the past 100 years or so. But if one were the cause of the other there would be a clear correlation between them at all, or almost all, points. There is not. What I see is a steady increase in CO2 output accompanied by a highly varied series of warming trends — until 1975 when the two do finally seem to correlate — until somewhere around 1998, or later if you prefer, when the correlation again breaks down. That is NOT consistent with causation. As the folks from NASA said, it’s a “mystery.” Either that or a flawed hypothesis. An ad hominem is not an “attack”, it is a fallacy. And in fact, it is YOU who have engaged in an ad hominem fallacy, when you asserted that your argument should be accepted, not on its scientific merit (or lack thereof), but because you are a “liberal”. After all, that’s really the exact same fallacy as asserting that someone’s argument should not be accepted because he or she is a “liberal” — which is of course one of the most popular rhetorical fallacies among deniers. All you have done is turn it around. We must do nothing that would reduce consumption of fossil fuels, and we must do nothing that would “divert vast amounts of money and resources” from the fossil fuel corporations to other sectors of the industrial economy. I totally missed that he switched from GISS to RSS for the moneyshot. That is clearly a denialist tactic–indicative of motivated reasoning at the least if not dishonesty! RSS is highly questionable at this point.